Moving Day! – The Island Cats…Every Cat wants to be an Island Cat! Today’s the day! It’s moving day! I hope the move goes smoothly and you all are soon settled into your new home. Exciting, scary (for kitties) and exhausting (for everyone)! We hope it goes well; good luck! How exciting! Can’t wait to see pictures of your new home! Good luck sweet friends, we can’t wait to hear that you all are settled in! Oh kitties, you are going to have views of the Detroit River now! Woo Hoo! WOWZERS! Hope the move goes well and you’re all snugged into your new place in no time at all…….finding all the NEW warm spots in the house will be fun. a “fibber mcgee’s closet” of emotions for sure … tiring, fun, exhausting (dusty/dirty!) … but exciting, too! Good meows to you today! I hope the move goes smoothly and you’ll get settled quickly! I hope your move goes smoothly. Hope to see your new digs soon. Good luck! I hope it all goes well for you! It will be exciting to be in your new home! Moving is a big thing, and our hopes are with you for a successful journey, Stay cool and be safe all of you. Ohhhhhhhhhhhhhhhhhhhhh I bet that is the best ever moving company in the world. We all know cats are efficient at delegating. We hope your move goes smoothly and to have a successful journey. Make they packed your toys and treats safely with fragile on the outside of the box. Thanks for the share. Hope all goes well and that the roads are safe. Yahoo!! Have fun settling into your new place!! We hope you’ll share some photos once you’re settled. Oh boy! Can’t wait to see y’all in your new digs – good luck! 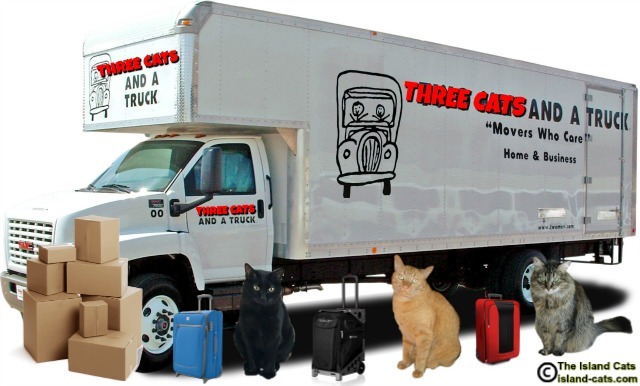 Happy moving day and remember, we felines have a tendency to want to go back to our old house so just stay in the new place! Moving is so exciting. Hope all goes well! Good luck, kitties! Can’t wait to see the new place once you’re all settled. I hope it’s a smooth move. Eeeek! Moving! We hope it went well! Good luck, everyone! And don’t forget to frisk the movers on their way out to make sure they didn’t take any nip! Good luck to all of you. We’re sendin’ hugs and purrayers fur a peaceful and calm transition. Best of luck to you all! We hope everything goes well and you three adapt quickly. We’re thinking of you! That is HILARIOUS!! Too bad the people who don’t live in Michigan won’t “get it”…..(at least I think they won’t)…………….that is hilarious! Best of luck with your move!! I hope everyting goes ok with your moving. Enjoy your new house! We will be going through this soon. Hope it went well for you. We are a bit nervous. You should have seen us when people came to view our old home! May all go well with your move and you find the new place is better than the old place! Have fun. Moving to new homes is such a great experience.